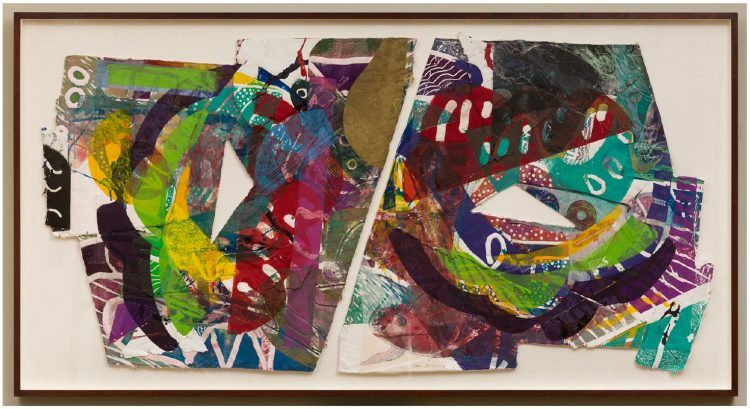 Born in Tupelo, Mississippi, in 1933, Sam Gilliam received his BA and MA from the University of Louisville. In 1962, he moved to Washington, DC, where the Washington Color School led by Morris Louis, Kenneth Noland, Gene Davis, Howard Mehring, and Thomas Downing had flourished. Following a period of figurative painting, Gilliam embraced abstraction and hard-edge geometric designs, and then experimented with expressive pourings. In 1967, The Phillips Collection purchased Gilliam’s Red Petals, and hosted his first solo show. While preparing for this exhibition, Gilliam discovered that by creasing, bunching, or crumpling paper still wet with watercolor, he could create an armature for his color combinations, a kind of drawing to structure his compositions. These experiments also shaped his approach to printmaking. In the early 1970s, while a visiting artist at the University of Wisconsin, Madison, Gilliam practiced printmaking with William Weege. In 1987, Weege founded Tandem Press, and Gilliam was the first artist invited to print there. Purple Antelope Space Squeeze is the first editioned work created for Tandem. Gilliam first sent Weege a drawing of the shape he wanted the paper to be, and a mold was made according to those specifications. The initial image was a relief print using carved woodblock elements and lithography inks. Then Gilliam attached handmade paper collage pieces he had painted. A variety of printing techniques followed involving inked and un-inked metal relief plates, steel and zinc etchings, and aquatint plates. Gilliam then hand painted details on the surfaces to prepare them for their final printing while inks from previous runs were still wet. Each impression of the print bears a unique pattern because the artist placed the printing elements in different positions and inked them in a variety of colors. Purple Antelope Space Squeeze is the second print and the eighth work by the artist to enter the collection. This entry was posted in Experiment Station and tagged printmaking, Sam Gilliam. Bookmark the permalink.